Hans Lollick, originally uploaded by captainjay. We finally made it out to Hans Lollick today! I've been looking at this island and beach for almost a year, since moving in the place, and have wondered what it looked like. It's pretty awesome! We picked up some friends in St. John and went over to Lovango to snorkel and hang out. Jay realized it was only 4 miles to Hans Lollick so we ran over to check it out. The water color was awesome and the sand really soft. The beach at the water line was a little rocky but still easy to walk up. We were cracking up at the few ragged lawn chairs at the tree line. I guess they were left by the campers that visit the island. We found all kinds of coconuts that were sprouting so we brought one back to the house and planted it in a planter. We named it Hans lol. We'll keep you updated on it's progress. Hey hey! Your blog has a nice, laid-back vibe to it and the pictures are absolutely great! I've lived here for about 5 years (from SoCal) and I've never seen such rad pictures of the VI. A mutual friend told me about your blog. I've got my own site too, maybe you'll check it out and get in a few laughs ^.^ Keep up the awesome work dude! 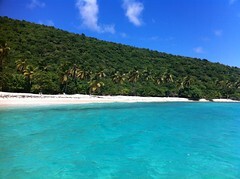 Picture review of our BVI "staycation"